This product has done wonders for me. I suffer from reoccurring yeast infections, and I'm lactose intolerant. Since I am unable to handle eating yogurt I knew I'd better find an alternative in order to get the probiotics my body needs so desperately. Ever since I began taking this product I have not had one problem. I can't even believe it has been this easy. Not one yeast infection since January! This is an important product for women's health. Affordable, easy on stomach, chewable, you notice results fast. The flavor is just OK. 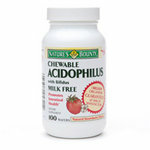 I try to always take acidophilus while on antibiotics to prevent tummy troubles. This keeps the good bacteria in your stomach in balance. These tablets taste pretty good and are easy to chew, and I have not had a problem with stomach upset while on antibiotics if I take this also. This is a great product for women who suffer from vaginal yeast infections after taking antibiotics. As soon as I am put on antibiotics I start taking them 3 times a day until a few days after I have stopped taking the antibiotics. Since doing this, I have not suffered from post antibiotic yeast infections. I have tried this during a yeast infection, and I felt no difference so I recommend that this be taken as a pre-yeast infection treatment instead of a cure. I like that it is chewable, tastes good and is inexpensive. I highly recommend it! It is chewable, tastes good and is easy on the wallet.